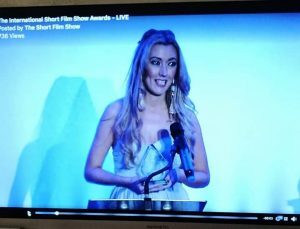 Amy-Joyce Hastings has tonight won the inaugural Award for Best Original Content on Sky Television’s International Short Film Awards for her short film Body of Christ. The Awards Ceremony was held in Nottingham and will be broadcast on Sky Channel 212 on Monday 26th March at 22:00. The entire first series of The Short Film Show is currently available on Amazon Prime. Body of Christ was commissioned by the Galway Film Centre (UNESCO City of Film). 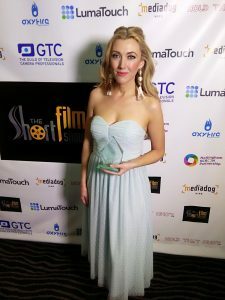 The film took home the Award for Best One Minute Film at the 7th Underground Cinema Film Festival, won 2nd place at the 28th Galway Film Fleadh’s One Minute Film Festival, and was nominated for the Micro Cinema Award at the Blackbird Film Festival in New York.